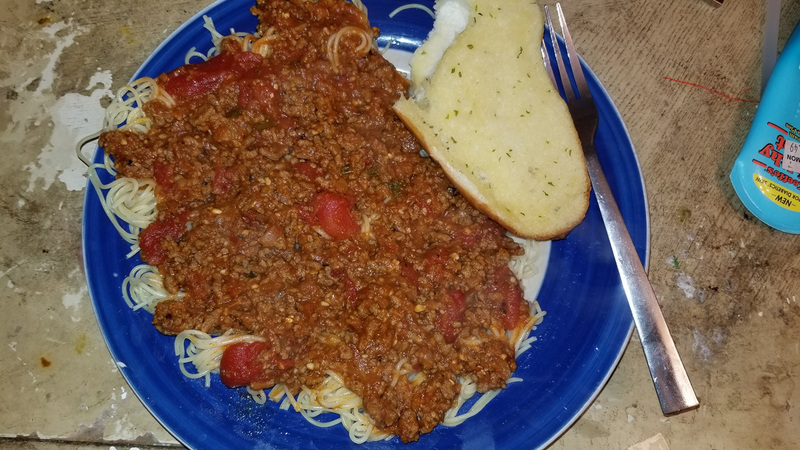 Olan's spicy spaghetti, served with a slice of garlic bread. I have mentioned before that my wife, Donna, does almost all of the cooking in our house. And with good reason, mind you; the woman is a genius. She regularly tries new recipes (and often adapts or creates her own), and it's extremely rare for the result to not be something we want to repeat - typically, the reactions range from "that's really good" to "that's better than the majority of restaurants I have ever eaten at". However, a few dishes fall under my domain; chief among them is spaghetti. This is one of the very few meals that every single person in my family (including picky Silas) enjoys in some form. While it does require both some prep work and a not insignificant amount of cooking time, it's not what I would consider to be a "difficult" meal, per se... and the results are perfect for anything from a romantic candlelit dinner to a full "feed the entire family" spread. When I was a child, my mother stressed the importance of everyone being able to cook to some degree, as you can't always count on your mother (or wife) to do it for you, there are situations where you want to be the one providing the meal, etc. My spaghetti recipe is based on hers; indeed, for some time, I basically cooked it exactly like she did. Over the years, I began playing with spices and such, and one fateful night, Donna asked me what I thought about putting red pepper into the sauce. At the time, we were really on a big "spicy food" kick - come to think of it, we never grew out of that - but my initial reaction could be accurately described as "horror". There are things that one simply does not do, and surely no sane person would think that making spaghetti hot and spicy would be a good idea. However, Donna used her "do it for me, baby" voice, batted her eyelashes, and I folded like a cheap suit. Lo and behold... the result was amazing! Proving yet again that Donna is almost always right about everything. These days, spaghetti features prominently in our meal rotation. It often gets made for Valentine's Day, but it can crop up at pretty much any time. Naturally, my batch sizes are a little scaled up due to the size of my family (I start with four pounds of ground beef, for instance), but I'm cutting that in half for the recipe below. Feel free to scale up or down to fit your needs. Scaling the recipe up and down is pretty simple. 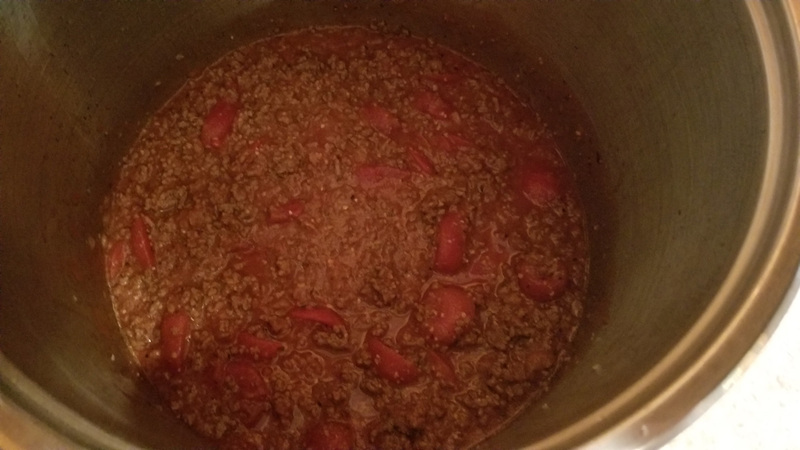 Use one can of the tomato sauce and sliced stewed tomatoes per pound of ground beef, and keep your spices in the same ratio as listed above (though do note that I like a little fewer chunks of tomato, so I only use three cans of sliced stewed tomatoes with my four pounds of meat). 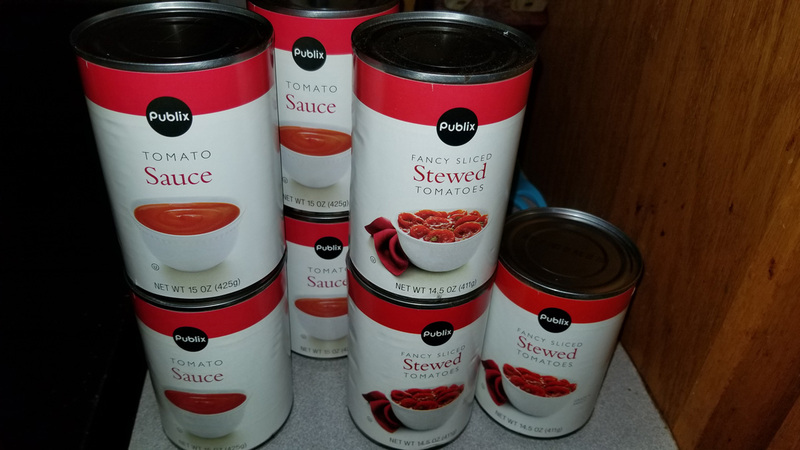 You'll want to taste the sauce as it simmers; remember that you can always add spices (but never take them away), so you may want to start on the smaller end of the listed ranges and add to taste. 1. Dice your onion rather fine. 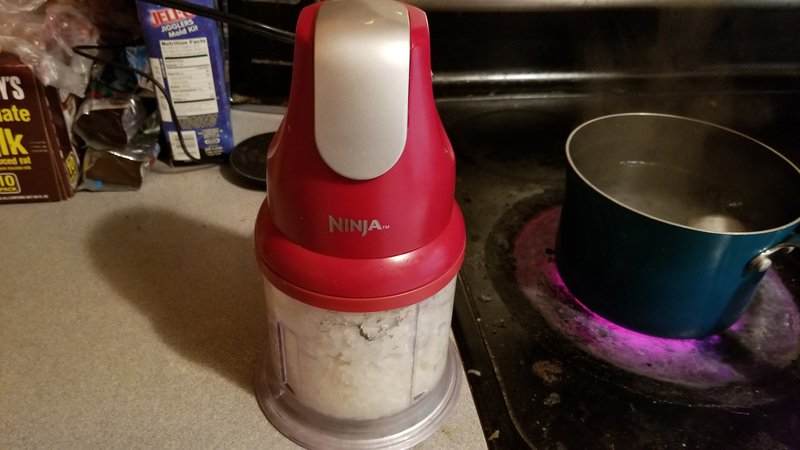 I personally use my Ninja chopper for this - the little sucker is so easy and reliable. One of the single most indispensable tools in our kitchen. Brown your ground beef with the onion in a large sauce pan (as you can see, the volume of my recipe makes a large pot necessary), and drain the meat. 2. 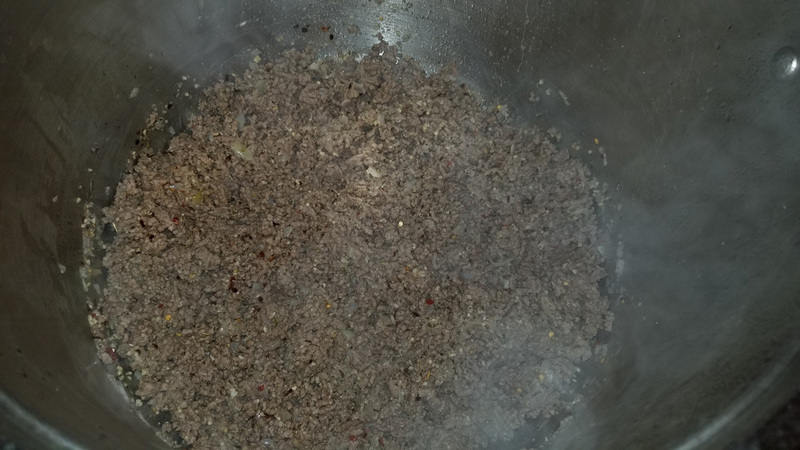 Add your seasonings to the beef mixture, then stir well. 3. Open your canned goods and add to the pan. Stir well. Tomato sauce and sliced stewed tomatoes. 4. Bring the sauce to a hard simmer, then reduce to medium low heat. Simmer for at least an hour, stirring often enough to prevent any scorching. Cooking the sauce at lower heat for a longer time gives better results than higher heat for a short time. Most of my family are not crazy about getting very large tomato chunks, so I make it a point to cut the tomatoes with my wooden spoon as I stir. The sauce itself, prior to full cooking. The sauce is ready once it has thickened noticeably - if you have a lot of liquid "juice", you need to cook it longer. 5. 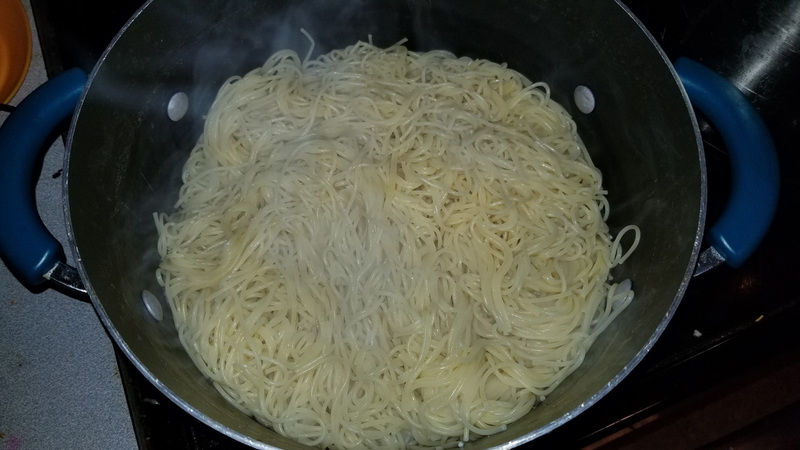 Boil your pasta in another pot. For best results, you're looking for al dente pasta - i.e. soft, yes, but still firm. You don't want it crazy soft, so don't boil it too long. Drain the pasta. The pasta in its pot. 6. Serve sauce over the pasta, with garlic (or garlic and cheese) bread on the side. 7. Do NOT mix the sauce and pasta and refrigerate together - store the leftovers in their own dishes. Your leftover sauce will be edible with a fork alone. And there you have it. A delicious, filling, quality meal that will make everyone in your house happy (and may encourage your significant other to show their affection for you). Enjoy! Tasty enough to show the picture again. If you enjoy HomeBrew Dad, please support the site by using my Amazon affiliate link when doing any shopping there. 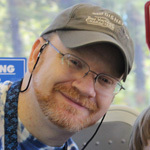 All prices are exactly the same, but HomeBrew Dad will receive a commission on your purchases. Thanks!